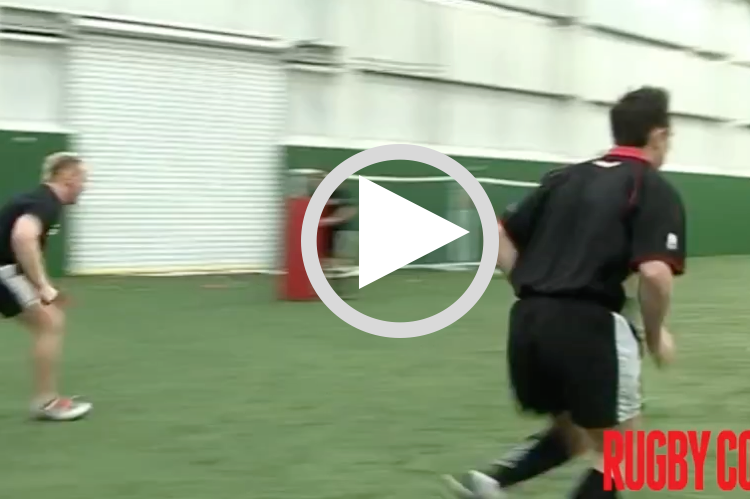 Use boxing-style footwork and arm movements to improve your players’ tackling. The players stay light on their feet, keep their arms active before “punching” like a jab towards the ball carrier, arms going to the side, shoulder engaging and head going into the side. The boxer moves lightly on his feet, able to go forward quickly when he sees the chance to strike. When a boxer punches, he must drive his body forward, just like a tackler. In this case, the “punch” is to the sides of the body, with the shoulder making the impact. The same foot and same shoulder transfers the most power. Players can experiment with what works best for them. They will, though, have to drive lower than a boxer. Stay balanced on your feet, light and with your arms in, hands up. Move forward to tackle when the target comes close enough. Punch your Hands beyond the target so your shoulder engages with the ball carrier. Put pairs of players inside a 10m square. Give one player a ball (or a cone to carry in two hands). Get the ball carrier to bob like a boxer around the box, with his partner shadowing him. When you shout “TACKLE”, the ball carrier plants his feet (see picture A). The non ball carrier then drives his shoulder into the side of the ball carrier and holds. Check for head positioning – there is no need to put the arms out at this stage. Repeat several times and then swap carrier but with the non carrier’s hands up in a boxer stance. When you shout “TACKLE,” he engages his shoulder and wraps his arms around the ball carrier. Do not put the ball carrier on the ground. The non ball carrier in the pair shadows the ball carrier until you shout “tackle”. The ball carrier stops, plants his feet and the other player drives his shoulder into the ball carrier. Develop by the non-ball carrier grabbing the ball carrier (but not putting him on the ground). Put pairs into 5m squares (make sure there is plenty of space between them). Get the ball carrier to move sideways between the two end cones, with the tackler shadowing him. When you shout “GO”, the ball carrier runs forward looking to score at the far end against the defender (see picture B). The tackler shadows the ball carrier as he moves side to side, using a boxing stance. When you shout “GO”, the ball carrier aims to get to the other side. Play 2v3 with two attackers aiming to score at the far end. One of the defenders can move between the two boxes, while the other two defenders have to stay in their area so there can only be two defenders at any one time in the same area as the ball carrier (see picture C). Rotate one attacker and one defender after each attempt. Use full contact. Play 2v3. The attackers can run anywhere. One defender must stay in each box, while the third roams freely.